Leaving the beautiful tulpen route of the Netherlands behind, we drove ever eastwards, through unchanging rural emptiness, barely registering when we slipped into northern Germany. The only obvious visual change was the greater number of wind turbines spread out across the windy flatlands. It was Nicky’s birthday the next day, so deciding a little bit of lazy comfort was required, we found a registered ACSI campsite nearby where we could utilise our recently purchased membership card for the first time. 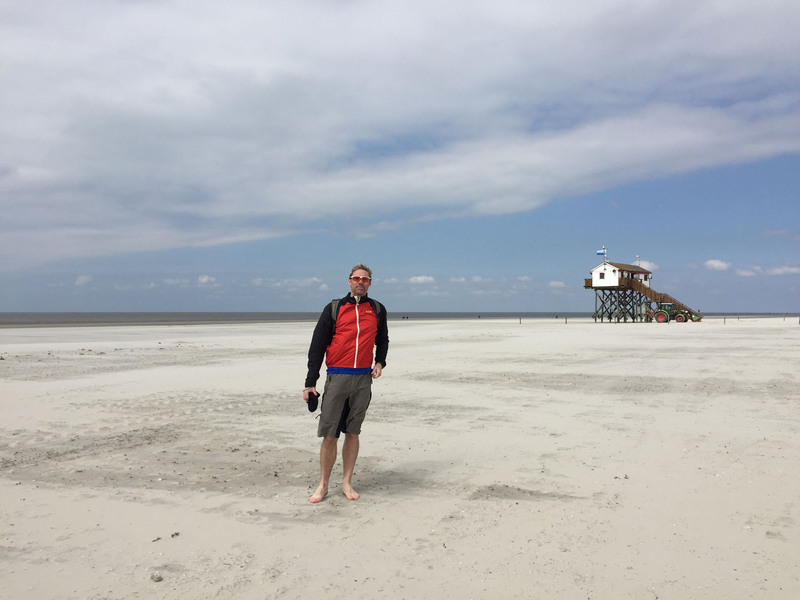 We settled on a site in Astederfeld, set adjacent to a white sandy beach on a large swimming lake, where we considered a birthday swim may be in order. We had two days of chilling, both still feeling a little fatigued from our busy days of planning and organising. It rained on and off, dampening the air, the grass and our willingness to exercise. We had planned to complete a lengthy swim but both the water temperature (11 deg) and our level of tiredness prevented us from actually getting in; a fact that disappointed us in hindsight and we slightly regretted the wasted opportunity. The site shop was not open on the Sunday we arrived, nor did it have any provisions on the May Day Monday morning. We walked 5km into the town of Neuenburg to find the only local shop touted to be open. It turned out to be a petrol station kiosk, and they also had no bread or fresh food available, so we marched that 10km for only a bottle of coke. The rest of the afternoon we chilled around Benny, repacking, reading and recharging, then enjoyed a lovely sunset across the fields. The next morning we drove to Bremen, stopping only to complete a quick shop, then drove past Hamburg without stopping at all. The scale of the industrial activity in Germany’s second biggest city and busiest port was definitely impressive, if not aesthetic. 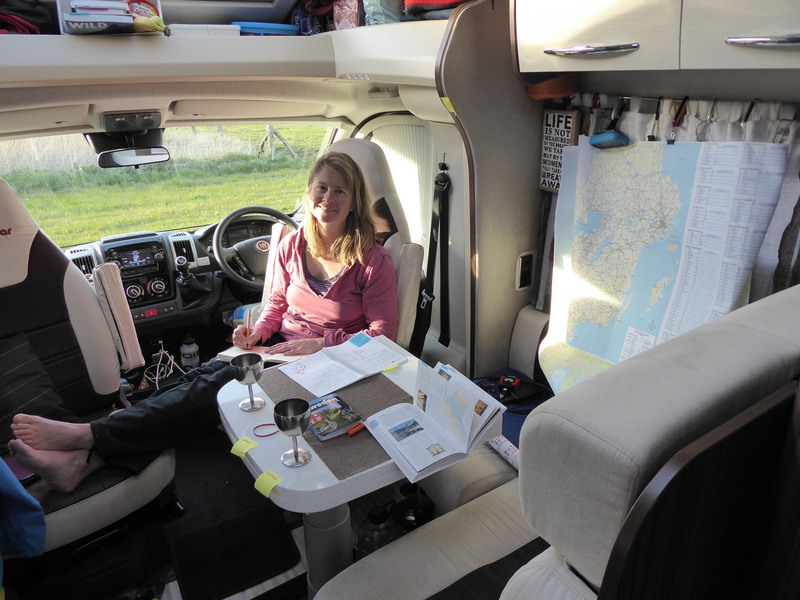 We were not in the mindset for city breaks, so making progress towards Scandinavia became our main goal. We stopped to overnight at a spacious free stellplatz in Kaltenkirchen, where we could service Benny and also pick up free Wi-Fi from the nearby town – bonus. 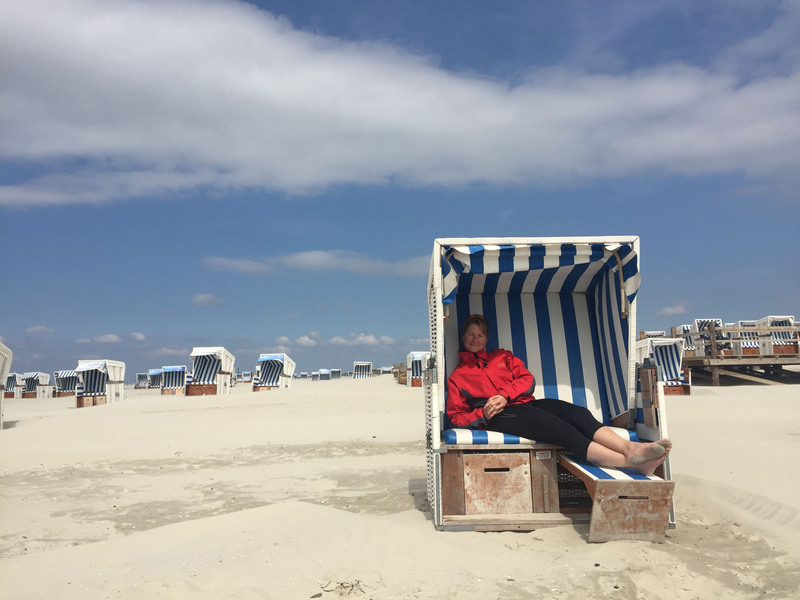 The following morning we pushed on to a peninsula on the west coast of Germany, where we had read a little about a special stretch of beach and decided to investigate. We took the Autobahn past Heide and Tönning and parked up in the small village of Garding to begin our planned cycle. We cycled through the central street of Garding, before making our way into the rural countryside, west and south. This was our first cycle through villages in Germany, and the style of buildings was both distinctive, but yet subtly different to the Netherlands. We passed austere red brick buildings with elaborate, decorative thatched roofs, set alongside colourful ship-lapped timber homes with steep slate roofs. The one notably absent feature was any personal fencing, hedges or boundaries around houses, with them all standing freely on a portion of land shared with neighbours and ownership denoted only by a change of planting or surface material. It made the houses look somewhat bare, even unfinished in some ways. This might be due to our own warped perception, being so used to seeing the extreme lengths and pedantic ways people in the UK go to ensure they define their exact boundaries and ownership. We did wonder about how young children and dogs are catered for though, with busy roads so close by. 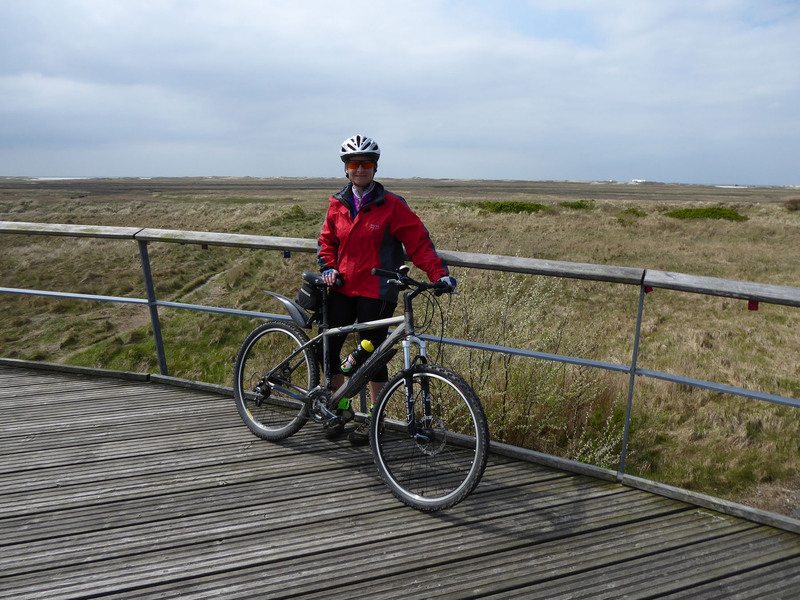 Further along we cycled adjacent to a military zone, along a large raised bund or dyke. It looking like an abandoned velodrome, with its old, tarmacked surface sun-melted and slowly running down the slope in thick black waves. Every so often a set of steps with a neat, timber viewing platform appeared, allowing visitors to rest up and look out over the expansive muddy marshlands towards the white beach. These inaccessible areas of grassy mud were reminiscent of wild savannah grasslands, flat and yellow, with only a hint of sand dunes behind. The only way to reach the beach was by crossing on these intermittent walkways on stilts, and only then by paying for a ticket. 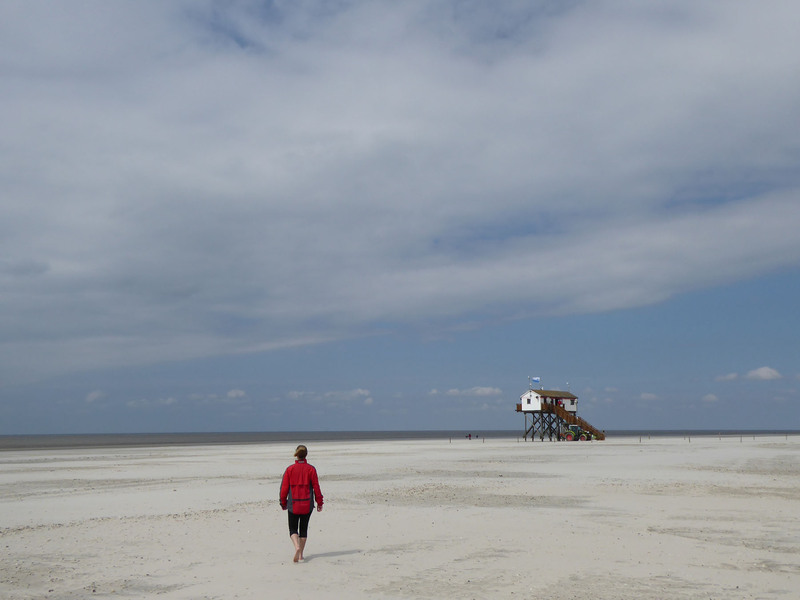 At the end of the town of Sankt Peter-Ording we, against ideological objections, relented and paid the €2 each to access the beach beyond the grass. 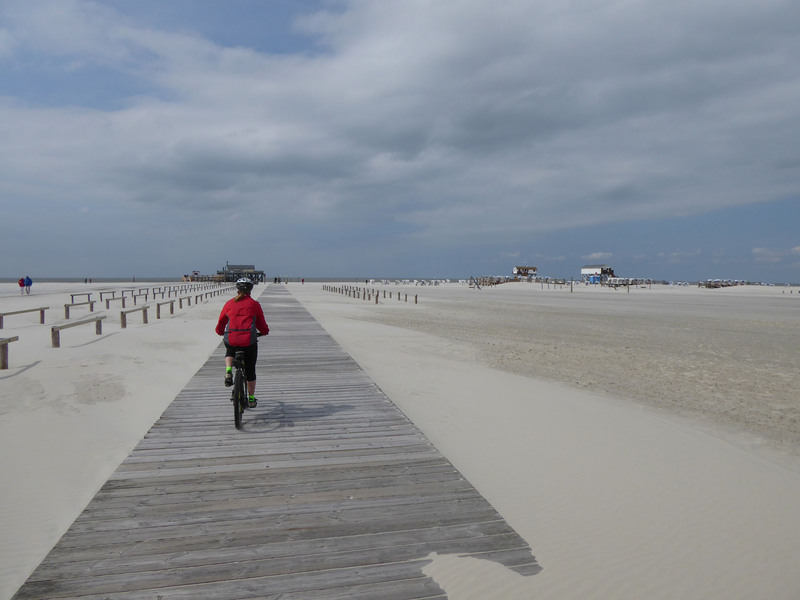 We cycled 1km down a wide smooth timber walkway occasionally covered by drifting sands to reach a cycle-park where we dismounted and walked barefoot along the sand. There were raised restaurants and cafes, set high on timber struts like short piers, showing signs of how high and wild the sea must be at certain times. Loose sand was blowing in pulsing waves across the surface of the beach, whipped up by the blustery cross winds. 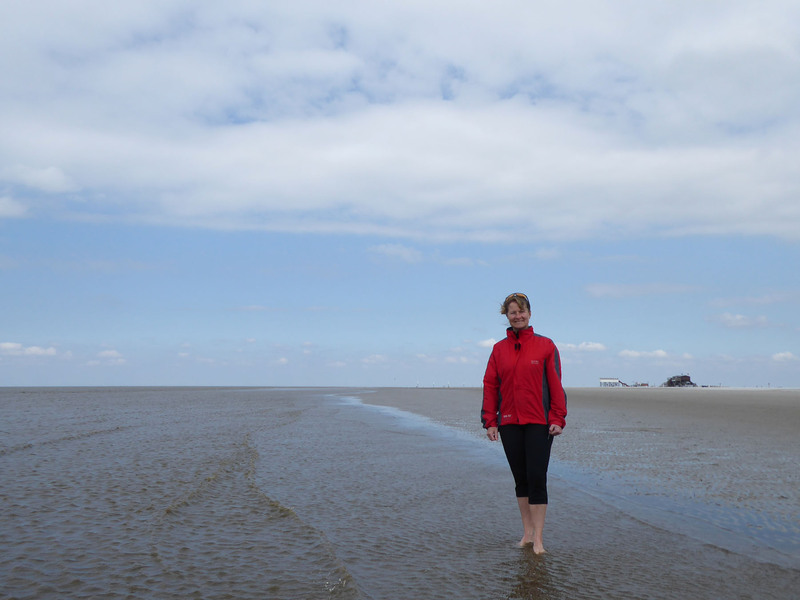 The tide was a long way out, but we persevered to reach the water and paddle a little, chilling and refreshing our feet. We happily sat in a blue and white striped double seat with moveable footrests and a fold-down drinks shelf, the sides providing instant protection from the constant wind. We looked like extras in a Punch and Judy show, but sheltered from the wind it became a totally different day and the sun soon warmed us through. 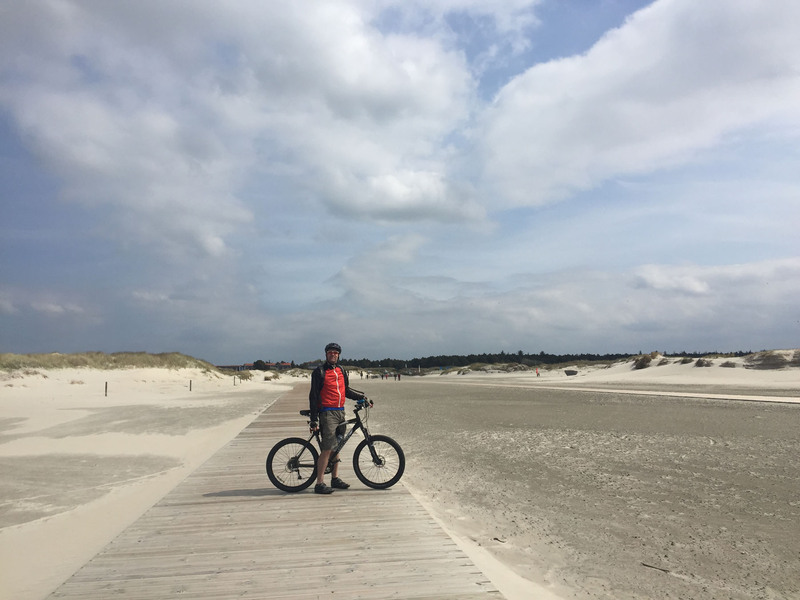 We later cycled through the pretty but rather twee town, filled with the usual beach-resort tourist shops, and returned to Benny by a similar route. 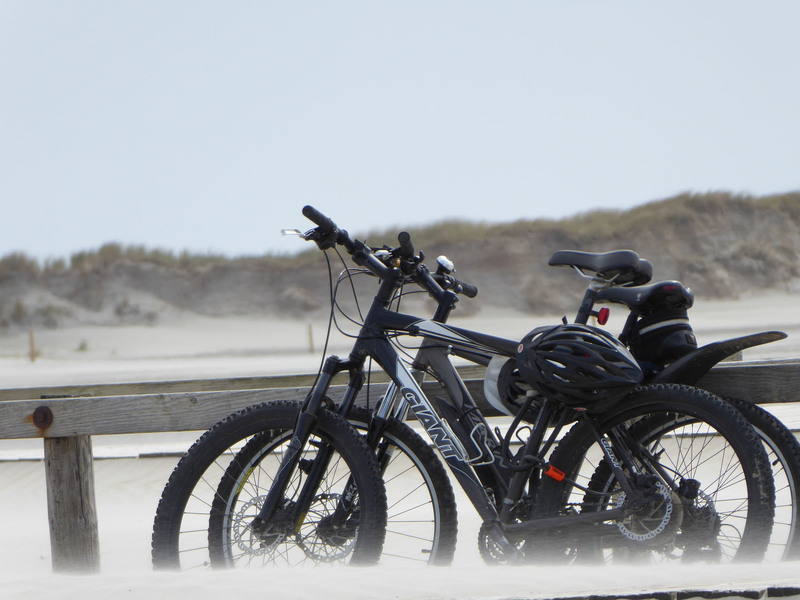 This time we were cycling into the hard bluster of the cold coastal winds and had to work twice as hard to go half the speed home. We then drove off from Garding to overnight in a free aire near the town of Lunden. This was a quiet, gravel car-park at the end of a long rural lane, by a river with views out over green fields and only a few curious cows for company. 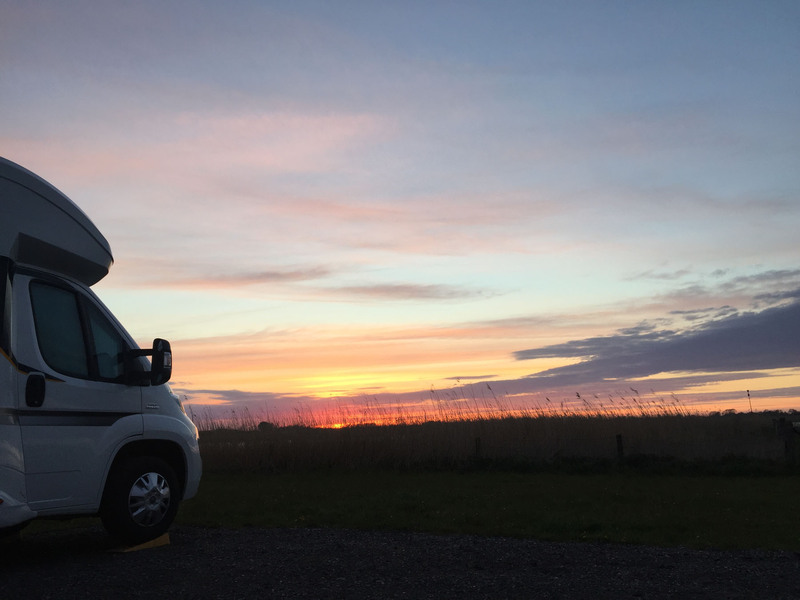 We enjoyed a late afternoon of planning our upcoming route followed by another deep red sunset and restful evening, our last in Germany for now; Denmark beckons. 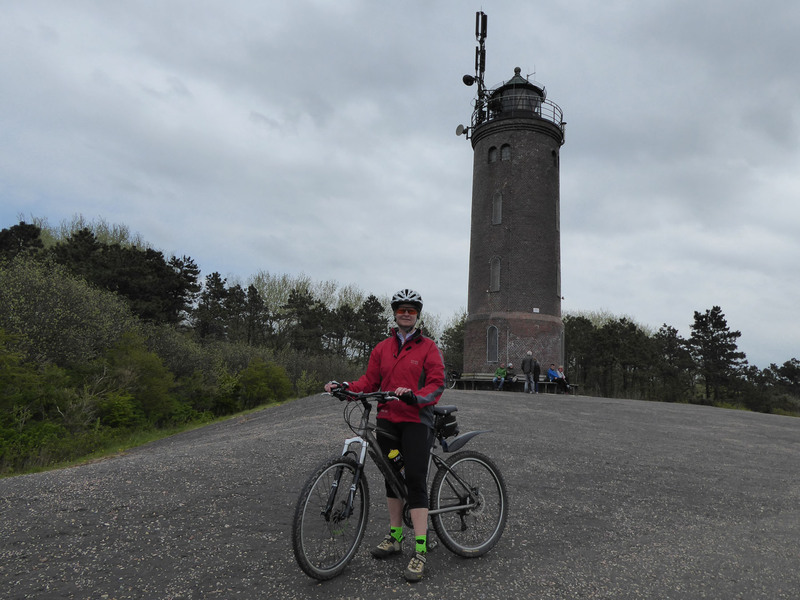 This entry was posted in 2017 Scandinavia Tour, Cycling, Germany, In Germany, Our Travel Journal on May 5, 2017 by Aaron Hill. 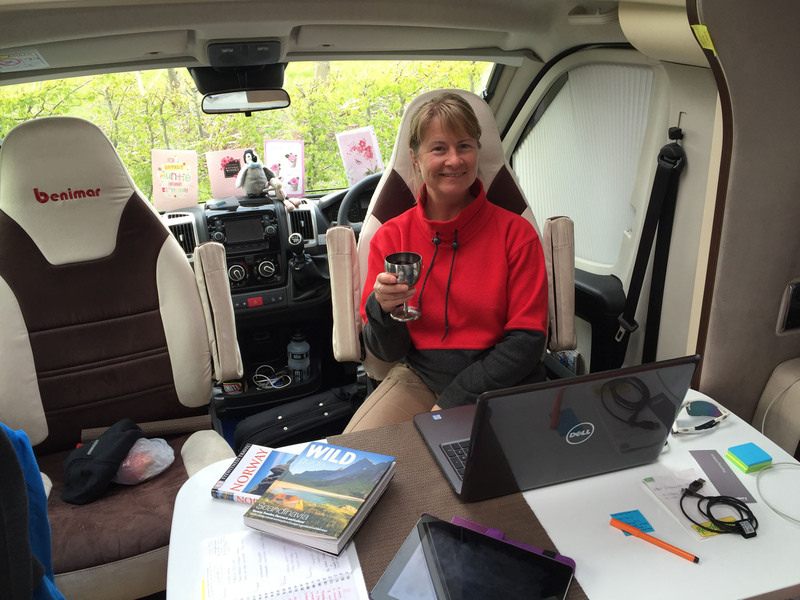 Enjoying the blog and photos. We are almost parralell travelling, stayed at Kaltenkirchen too.